Once we finally left the campsite, we made our way to the location just inside the Zion National Park boundary where we were to park our car – because we had to stash our car and the end of the hike and hitchhike to the trailhead. After waiting for just over an hour, in the middle of nowhere, for someone to give us a ride, we hopped into the back of a pickup truck of a kind local, excited to have the wind in our hair and the trail in our sights. At the trailhead, we dismounted, waved thanks to our Good Samaritan and made our way into the wilderness. The trail was scantily marked with cairns (small stacks of rock that indicate the trail) but we did a fair job of making our way through the little valleys. The hike turned dangerous when - after we saw the steep walls of the slot canyon in front of us - we tried to hike straight to the canyon, but almost hiked off a 40 ft precipice. Indeed, our canyon was ahead of us, but 40 ft below, and we were forced to double-back to find the river. What distinguishes the slot canyon from other types of canyons is that their walls are basically parallel to one another. 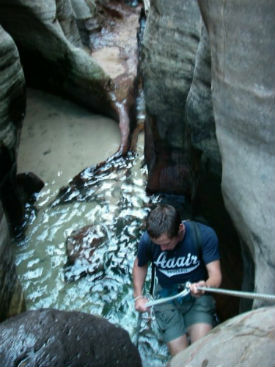 To canyoneer means to follow the water through the canyon, regardless of the terrain. The canyon that we hiked is called The Subway and is a beginner level hike, so much of the time we were walking alongside the water, through the water, or on rocks elevated beside the stream. The walls varied from 5-20 feet apart. There were, on occasion, instances when we had to swim through the water because it got too deep and went from wall to wall. And it is notable that the water in slot canyons rarely sees the sun and is very cold, We were freezing when we had to swim. However, it was exhilarating. In addition, we had to rappel down waterfalls when there was no way to hike or safely climb down. The rappels were very simple for this hike of the subway, but they were rappels nonetheless. So, it was very fun. Very. But we had to be extremely careful as well. Each of the three rappels was only about 10 to 20 feet in height however, that did not take away from the enjoyment of hooking into a rope and hopping down the rockface while the water cascaded over our feet. It was important that we had the proper gear throughout, and David's Chacos and my Salomon Techamphibians were vital for our feet – because they could get wet and have good grip, yet not slow us down. Additionally our harnesses were quite obviously vital to our safety and we wore them the entire time. For me the next most crucial item that we carried beside water was my SealLine dry bag - which held our cameras and phones (in case emergency) safe and dry. The main things to focus on for safety when canyoneering are watching your step so that you don't slip on the rocks, making sure that you rappel correctly, and making sure you are prepared with enough water and the proper equipment. David and I had a fairly safe adventure through the subway, which was completely rewarding, and became more and more really brilliant as we went on. There were however, two instances one person each where we placed safety on a back burner and wanted to have a little bit of fun. First, when I was on the last repel rappel, I wanted to kick off the stone wall and do a 360°. However, though the rope was 15 feet from the belay device above, I really only had 8 feet of rope that was over me before it touched the rock. Because of this, the fulcrum for me rotating was much lower and much closer to me than it should've been. Henceforth, I only made 180° before I hit the wall. My back hurt. But, not too bad. It was worth it to give it a go. David's moment to shine came once the canyon began to open up a bit, once the repels were done and we were starting to see lots of foliage again, as well as more of the sky. We had come across a waterfall that looked like it was round and - with the red rock underneath the water it - looked like a smooth red slide with water flowing over it. David wanted to slide down, so I hiked very carefully down the side of the waterfall as David got momentum and started to give a little run up to the falls. I took out the video camera and captured this gem on the tape: David skidding out of control and flying off the side of the waterfall, gently bruising his tailbone. The waterfall was not quite as smooth as it had looked. 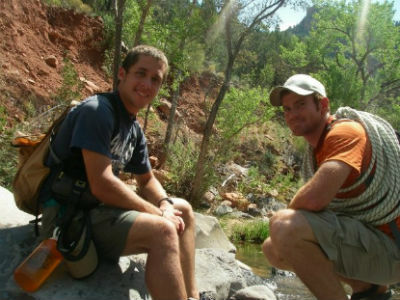 Naturally, we enjoyed even these exploits, but it is very important to choose wisely your decisions in the canyons. Make sure you’re prudent enough to - though enjoying yourself - you don’t risk too much for the experience. Because, when you’re in the middle of nature, it’s a lot more difficult to be safe. 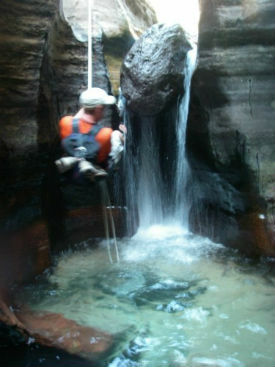 The one piece of advice I would give to anyone interested in canyoneering is to go prepared. Prepared with the proper equipment, prepared with the proper mindset, and prepared to have a wonderful experience.